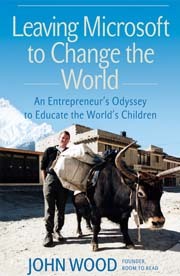 John Wood’s book ‘Leaving Microsoft to Change the World: An Entrepreneur’s Odyssey to Educate the World’s Children‘ is his own story about leaving corporate world to start his own non-profit organization ‘Room to Read‘. This book is full of inspiration, emotions, business strategies, entrepreneurship and human values. A proof of the power of one individual to influence and help the lives of thousands of families and communities especially in the developing world. John Wood was Microsoft’s Director of Business Development for the Greater China region when he decided to say good bye to the corporate world and enter the world of non-profits by helping the poor children in the developing world to give the lifelong gift of education. The core belief of ‘Room to Read’ is, ‘world change starts with educated children‘. The defining moment of John Wood’s life had happened when he was trekking in Nepal on a vacation to escape from the work. One day, Wood met Pasupathi, resource person for that province and responsible for providing facilities in the schools of that province. Along with Pasupathi, Wood visited a school, which is supposed to be the biggest school in that area. He could not believe his eyes and was moved by the way school had been operating. He was confronted by the harsh reality that there were no books in the library that a child can read and the class rooms were accommodating more children than they actually can. After interacting with the school headmaster and teachers, he promised them that he would return with books and help the school build a better library. Then the headmaster of the school said, ‘Perhaps, sir, you will someday come back with books.‘ In the book, he shares that these words had really changed the course of his life forever. An year later, John Wood did exactly what he promised the headmaster and the teachers of that school. With the help of his friends and family, he was able to collect a large number of books and went to Nepal to distribute the books. But, Wood felt the task was not finished. There were literally hundreds of schools with not enough books and few communities did not have schools in the neighborhood and children had to walk for few kilometers to reach a nearby school. He thought, there was something more that he can do to address this issue throughout Nepal. The following year John left Microsoft and established a non-profit to send books to Nepal. You should read the book to know how this small project to help build a library in rural Nepal school has now become a world famous organization with operations in nine countries in Asia and Africa. Ever since it’s inception, Room to Read has impacted the lives of over 1.3 million children by: constructing schools, establishing libraries, publishing local language titles for children books, girl scholarships and establishing computer labs. ‘Leaving Microsoft to Change the World‘ is one of those few books which everyone will like to read. No matter where you live and what is your work, you are going to remember this book for a lifetime. The story is so inspiring and uplifting that you will start considering doing something to make the world a better place to live. Most of us have taken the education for granted, but that is not the case in the developing world where standard education is a dream for millions of children, and that dream will only come true when people like John Wood dedicate their entire lives to make that dream become a reality. Keep a box of tissues handy. Few of the lines are so moving that I was brought to tears while reading. I finish this review by asking you to go and buy the book and share the story with your friends and ask them to read. I am very sure that you are going to like this book and every second is worth spent reading this book.